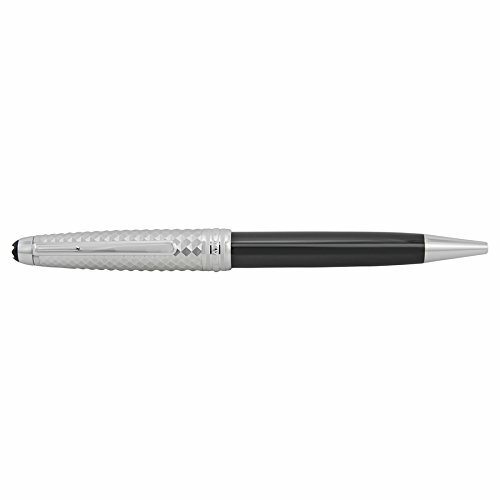 A stunning Ballpoint pen from the Montblanc Meisterstuck Collection. This pen is crafted in a beautiful black precious resin barrel. It features a luxurious platinum-plated clip and cap with a 3-D geometric pattern and twist mechanism. Compatible ballpoint refills (not included): Mystery Black, Pacific Blue, Nightfire Red, Fortune Green, Amethyst Purple, Barbados Blue, India OrangeWriting System: Ballpoint Pen with twist mechanism. Platinum-plated cap with three-dimensional geometric pattern. Clip: Platinum-plated clip with individual serial number. Cap: Platinum-plated with three-dimensional geometric pattern, inlaid with Montblanc emblem.